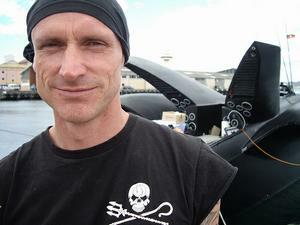 TOKYO, Japan, July 7, 2010 (ENS) – The trial of anti-whaling campaigner Peter Bethune, 45, of New Zealand concluded today in Tokyo. The environmentalist and captain of the Sea Shepherd ship Ady Gil was found guilty, handed a two year suspended sentence and banned from Japan for five years. Bethune will be deported back to New Zealand on July 9. Bethune was facing up to 15 years in prison on five charges that arose after he boarded a Japanese whaling vessel in the Southern Ocean to perform a citizen’s arrest warrant on the captain for ramming and sinking the high-tech trimaran Ady Gil in January, during a clash over Japan’s whaling in the Southern Ocean. Bethune also presented the captain of the whaler Shonan Maru #2 with a US$3 million bill for the loss of the Ady Gil. A dedicated environmentalist, Bethune in 2008 broke the official global circumnavigation speed record in the high-tech trimaran, then known as Earthrace, using only 100 percent biofuel. He conceived the unusual design of Earthrace, and found the funds to build it, at great personal cost to himself and his family. He motivated a team of volunteers and supporters around the world and succeeded in breaking the global circumnavigation speed record in order to increase awareness of the need for renewable fuels and sustainable living. 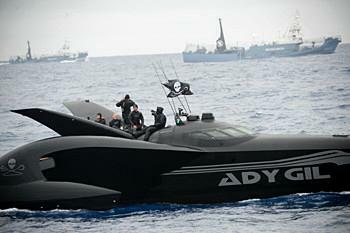 This dedication that so impressed U.S.-based Ady Gil, founder of the theater-scale digital projection system American Hi Definition, that Gil made the $1 million donation that helped enable Sea Shepherd Conservation Society to include the re-named trimaran within their fleet of vessels for the 2009-2010 anti-whaling campaign. 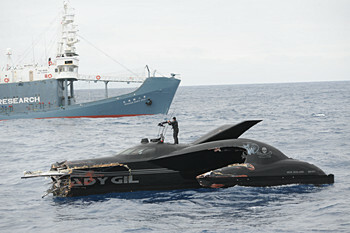 On December 22, 2009, the Ady Gil arrived in Antarctic waters. On January 5, 2010, Captain Hiroyuki Komura used the Shonan Maru #2 to ram the Ady Gil, slicing her in two and sinking her. The six Sea Shepherd volunteer crewmembers aboard the trimaran nearly lost their lives and were rescued by another Sea Shepherd vessel, the Bob Barker, which had just arrived on the scene after a three-week voyage from Africa. On February 15, Bethune boarded the Shonan Maru #2 intending to carry out a citizen’s arrest of the ship’s captain. He was held as prisoner on board and was arrested on March 12 when the whaler arrived in Japan. The criminal trial against Bethune began in Tokyo on May 27. He was charged with trespass, causing injuries, forcible obstruction of business, destruction of property and illegal possession of a knife, the pocket knife he used to cut the anti-boarding net on the Shonan Maru #2. During his trial, Bethune accepted four of the charges but refuted the charge of injuring a Japanese crewman, insisting that the man injured himself using his own pepper spray. On June 8, Sea Shepherd publicly announced that it was severing ties with Pete Bethune, saying he was no longer a member or representative of the organization. “Sea Shepherd spent in excess of half a million U.S. dollars on Captain Bethune’s defense, not because we believed he would be acquitted, but in an attempt to mitigate his sentence,” said Watson. 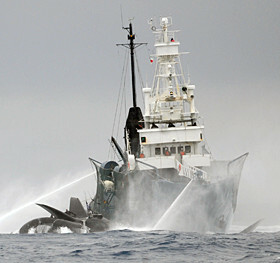 “Sea Shepherd is proud of Captain Bethune’s achievements and satisfied with the results of this ridiculous trial that saw a man incarcerated for saving the lives of whales, yet ignored the crimes of a Japanese poacher who sank a ship and almost killed six conservationists,” he said.